The workshop will take place Friday the 14th of August, 2pm-5:30pm at ISEA15 in Vancouver, Canada. The workshop is organized by Andreas Zingerle and Linda Kronman (KairUs). Minimum 10 maximum 26 participants required for workshop. Participants will be notified receiving more detailed information by the 7th of May 2015. In this workshop we revisit the SPAM folder to see if there is something valuable we can learn from there. This workshop will be offering the participants both a theoretical and practical introduction to interactive narratives in ‘419-fictional environments’ created by scammers and scambaiters. We seek to understand different sides of online fraud and through creative storytelling reflect on issues like online privacy, virtual representation and trust within networks. We also draw parallels to other practices and cultures like: gaming, transmedia storytelling and creative activism. 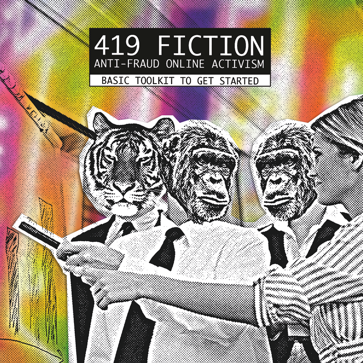 With the help of a ‘419fiction toolkit’ participants are introduced to tactics of creating fictional characters and infiltrating a scammers story-world, this to observe and interrupt their workflow. We explore how persuasive narratives are setup, how characters are designed and how dialog is exchanged to build trust between the acting parties. We will have a look at how social media, various content generators and other tools are used to orchestrate Internet fiction, creating entrance points to a story world and spreading traces of information online. The workshop also includes hands-on social engineering exercises to gather information about the scam and the scammer and how this can be used to warn other potential victims. By reflecting on scam bait experiences we enter a discussion around the topic of interactive narration connecting to the participants’ and their general work in this field. The intended audience of this workshop would be students, artists, writers, narrative designers, and other people involved in the creation of interactive storytelling on a practical level or those with an interest in that direction. We also welcome creative practitioners interested in disruptive tactics like subverting and social engineering. Attendees should be willing to actively participate in the discussions and the practical exercises which require most of the participants to bring an own laptop. No prior experience in the topic is required, yet if you have research or created artworks with a focus on Internet fraud, scams, spam or fake identities let us know so we can include you and your artwork/research into the introduction session. Half day workshop is divided into two sessions Part 1: Introduction and Part 2: Hands-on & Discussion. The theoretical module introduces the participants to the history of scamming, different types of scams and the disruptive practices of scambaiters. The practical part of the workshop starts by introducing the participants to a specially designed ‘419fiction toolkit’, a collection of tips for secure and ethical scambaiting.Through examples we give instructions how to start a non-traceable design of a new identity, tools to design a credible character and a story world around the bait by using transmedia storytelling methods, social media and various content generators. In the hands on exercises we analyze a e-mail correspondence of scammers by testing some of the typical social engineering tactics used by scambaiters. We will end the day in a discussion asking how these disruptive tactics can be used as a part of media competence training? Linda Kronman is a media artist and designer from Helsinki, Finland currently living and working in Linz, Austria. Since year 2000 she has worked as Graphic Designer, Art Director and Animation Designer and taken part in several multidisciplinary Research & Design projects. In her artistic work she explores interactive and transmedial methods of storytelling with a special focus on digital fiction. In connection with her studies at the MediaArtHistories program in Danube University Krems, she explored participatory ways to experience and archive social media fiction. She is interested in participatory art and design practices, specially in connection to creative activism. She has organized several participatory workshops and attended international exhibitions including Moscow Young Arts Biennale, Siggraph ASIA, NEMAF and WRO Biennale. Andreas Zingerle is a media artist from Innsbruck, Austria. He is a PhD candidate at the Timebased and Interactive Media Department in Linz (Austria). He is researching scambaiting strategies and implements their mechanics in interactive narratives and media competence trainings. In the last years he worked on several installations exploring a creative misuse of technology and alternative ways of Human Computer Interaction. Since 2004 he takes part in international conferences and exhibitions, among others Ars Electronica Campus, Siggraph, Japan Media Arts Festival, File, WRO Biennale.